I know from personal experience that there is substantial consumer interest in learning about sport optics. My online articles Binocular Basics and Telescopic and Red Dot Sights continue to draw large numbers of readers every month and frequent e-mails from readers asking for more information. Now, for only $24.95 (2014 MSRP), anyone who wants to know all about binoculars, spotting scopes and riflescopes need only purchase Alan Hale's book Sport Optics. Sport Optics is published by Hale Optics and can be ordered online at a modest discount from www.amazon.com, who described it thusly: "Sport Optics is a helpful guide for purchasers of binoculars, riflescopes, and spotting scopes for use in hunting, bird watching, astronomy, nature viewing, and other hobbies. The book helps one make the correct purchasing decision after considering the various optical parameters with the intended use for the product. The author has been in the optical industry for over 50 years selling and designing optical instruments and intimately knows optics." Alan Hale, Chairman Emeritus and former President of Celestron International (for decades the leading U.S. manufacturer of astronomical telescopes), has impeccable credentials in the optics industry. Alan has undoubtedly forgotten more about high quality optics than most of us will ever know. As the former Manager of France Photo in Eugene, Oregon (a Celestron telescope, spotting scope, binocular and optical accessories dealer) for some 15 years, I got to know Alan as an optical authority and a most unusual company president. I first met Alan Hale in the late 1980's, when I telephoned Celestron to ask a business related question. To my surprise, Alan answered the phone. Having dealt with other giants in the optical industry for years, such as Nikon, Canon, Minolta, Asahi Pentax and Leica, I can tell you that such a personal, hands on approach by a company president is most unusual. My original question answered, as fellow amateur astronomers we somehow digressed into a casual conversation about telescopes and optics that resulted in Alan inviting me to visit the Celestron manufacturing facility. At that time Celestron was an independent, American owned company and all of their famous catadioptric telescopes, from the C-90 to the C-14, were made in Torrance, California, USA. When I met Alan in person and got an in-depth tour of Celestron, I was struck that Alan, the other Company executives and the Celestron employees all seemed to be on a first name basis. Everyone at Celestron, from top to bottom, seemed personally invested and inordinately proud to be participating in the domestic manufacture of industry leading, top quality telescopes. Company morale was sky high. The whole experience was a revelation, not only in the art and science of optical design, precision optical manufacturing and metal fabrication, but of company management and employee relations. Under Alan's active leadership, Celestron was a heck of a good place to work. Now retired from active management at Celestron, Alan has written a book, completely independent of Celestron, to share with us a wealth of useful and practical information about binoculars, spotting scopes and riflescopes. 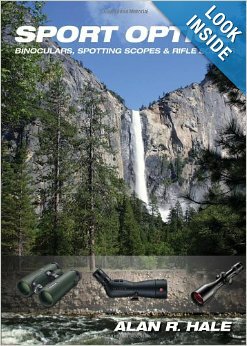 Sport Optics covers binoculars, spotting scopes and riflescopes for consumers in 186 fascinating pages. Alan's purpose was not to compare products, but to write an educational book to help consumers learn the things they should know about optical products and the optics market. Everyone who uses or is contemplating the purchase of binoculars, telescopes or riflescopes, including all sports fans, bird watchers, shooters and amateur astronomers, should read Sport Optics. Sport Optics is a valuable reference work and should be considered required reading. There are chapters about choosing and buying sport optics, their usage, optical details, understanding optical specifications, special optics, optical design, the inspection, cleaning, storage and repair of sport optics and even future technological evolution in the optics industry. The chapter "Who Manufactures Sport Optics," for example, is an eye opener. Perhaps best of all, Sport Optics is written for the layman in a clear, understandable and interesting manner. Sport Optics is not a boring textbook on optics, but an interesting, engaging and informative read. Copyright 2015 by Chuck Hawks. All rights reserved.